In 13 chapters narrated for 20 minutes over 13 hours, Josh Kaufman illustrates : what tools, techniques and principle you need to master to set up and run a business. 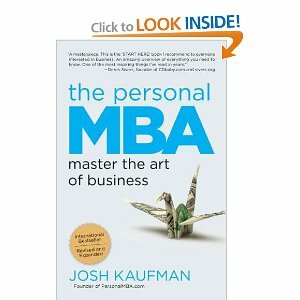 The books argues that, one don’t need to spend all the time, effort and Money on having an MBA. The Personal MBA gives you all the answers you need to start and run a business. It also keeps highlighting flaws in MBA curriculum that are no longer valid or are build only on theories and not practical experience. The book, I believe is very rich, yet very interesting. The approach to clarify ideas and principles is very smooth and I never had to repeat any part twice to understand the idea highlighted. While listening, I never lost the interest to listen more and more. Not a singly time! As for the structure, the book covers almost everything you need about business administration, it also highlights how human minds and systems works and how to use all of that to your advantage. So is it really all what you need? definitely not, that’s also what’s the book states, the learning process keeps going forever J. So even while applying the practices and guidelines in the book, one still need to keep evaluating and enhancing. Finally, I highly recommend this book for everyone! it’s just very nice even if you’re not considering starting your own business.